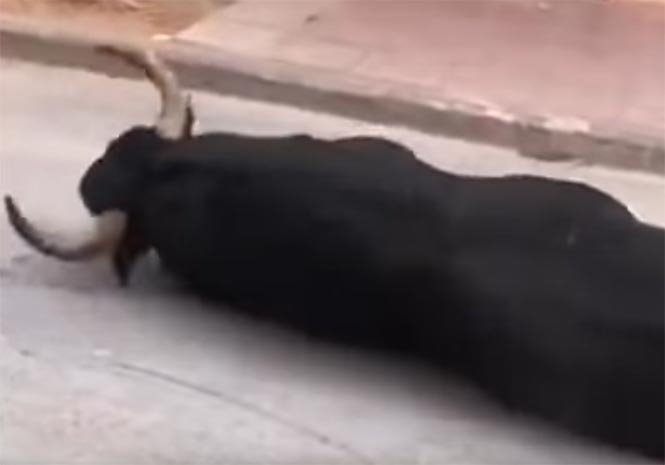 FOOTAGE of a Spanish fighting bull collapsing in the street has sparked outrage. The distressing clip shows the animal unable to support its own weight after being released during the traditional ‘Bous al Carrer’ bull running celebration in Villareal, Valencia. In the video, it struggles for a few steps before falling to the floor, where it repeatedly slams its horns into the tarmac as it writhes in apparent pain. Onlookers then pull it to its knees by the tail but it quickly slumps to the ground again. And activist group Tauromaquia Es Violencia (Bullfighting Is Violence) is planning to march through the streets of Madrid this weekend in protest. The organisation is hoping to attract more than 30,000 people from 180 animal rights associations after launching a rallying call online. Spokesperson Marta Esteban said: “This bull was in a cage, like a box where they carry them, which is only two metres by two metres. “In these boxes, they stay in the dark in extremely high temperatures for many hours. “Some of them lose about 30kg before they are even released. So that already is a terrible suffering for them who just want to be with the herd. She added that the disorientated animal had hit its head on a metal barrier after being set loose, and that vets say the collapse could have been caused either by the impact or exhaustion. “In any case, we want to make it clear that there is no show with bulls that does not imply cruelty, even if there is no blood,” she continued. The Spanish are filthy savages IÃ¢ÂÂm afraid. Poor animal……..when will Spain stop all this cruelty with bulls and horses……….move forward Spain, don’t stay in the past with this horrendous cruelty.